One of the housemates at the ongoing Big Brother Naija reality show, Tobi has received twos strikes from Big Brother. Big Brother housemate, Tobi got really close to being disqualified from the house yesterday during the eviction show after he was issued a second strike. This comes after his misdemeanor in the house in the previous week. 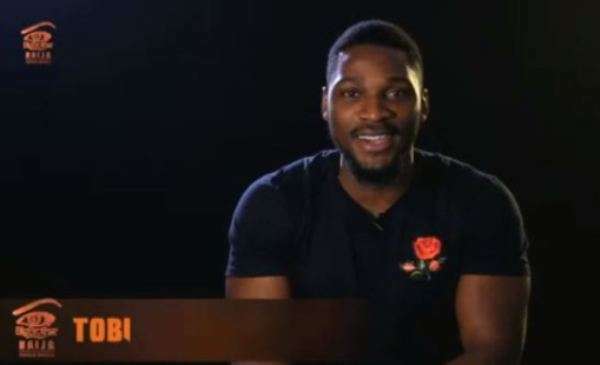 It will be recalled that the banker had ignored Biggie’s call to the diary room and as if that wasn’t enough misbehavior, he was linked to a conspiracy in the house when he told fellow housemates, Anto and Lolu to vote out his drama queen housemate, Cee-C.
Before yesterday's live show, Biggie had played a footage of Tobi talking with Anto and Lolu where he supposedly told the pair to put Cee-C up for eviction. Biggie gave him a chance to explain himself and he did, saying he was not referring to Cee-C but Ahneeka. This prompted Big Brother to issue him a strike making it a total of two strikes. This means that if he misbehaves one more time, he sure would be leaving the Big Brother house.